Steam wrote: The taming of the Red Planet has begun! Corporations are competing to transform Mars into a habitable planet by spending vast resources and using innovative technology to raise temperature, create a breathable atmosphere, and make oceans of water. 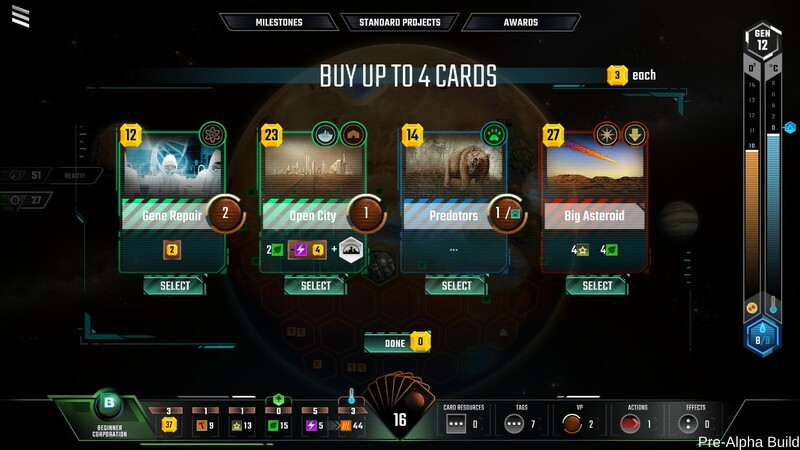 In terms of graphics, music and atmosphere it looks great, but in terms of complexity I doubt it will be above the similarly mediocre Offworld Trading Company since it comes from a board game. But maybe it will shine as a quick multiplayer game. "3rd Quarter 2018." I.e. it should be out by tomorrow. Since it's obviously going to miss that, I put it down as TBA 2018. Just released. 17 days late isn't too bad. 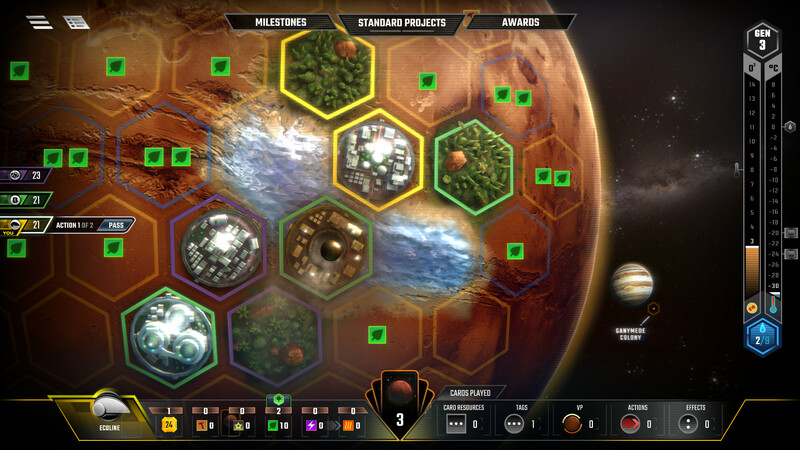 Launch day: start terraforming today! 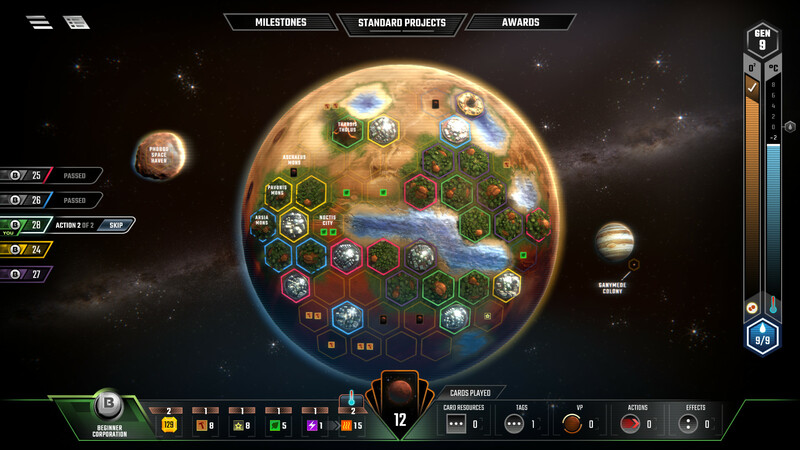 I LOVE terraforming mars. I have played an endless number of games with friends and colleagues i own all the extensions, so am a fanboy and i consider myself a very good player. Now. 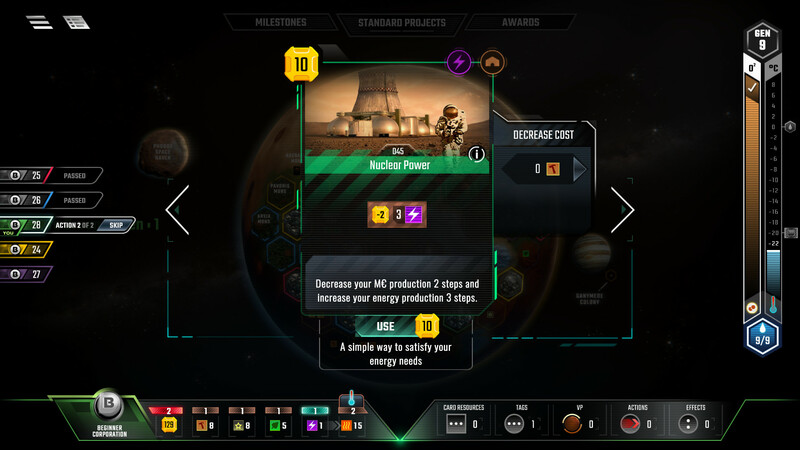 The computer-version of the game feels clunky. The interface is needlessly large yet contains little information of what is going on. Everything is hidden behing layers of menus - and its really not all that beautiful. It looks a lot as if it was made for people with poor eye sight. Too much icons, too little text. Which makes the game extremely slow playing. Also: The AI is abysmal (only tried hard AI). It kept on building greenerys, creating perfect places for cities (which i promptly build of course) and even keeps on building greeneries, which will give ME additional VP at the end of the game. They kept on building cards, which were pointless at the time (it is a bad idea to buy and play a card, which gives you 1 VP for every 4 bacteria in the pre last round of the game!!!). The AI never actually played for the special bonuses on the temperature/oxygen tracks. And so on. Right now i am deeply disappointed.